Shoulder surgery can be a complex procedure, and recovery can vary widely, depending on the extent of the surgery and the severity of the damage. Physical therapy should begin immediately following surgery and can last weeks to months. You must progress through each stage of physical therapy before moving on to the next. Your rate of progression largely depends on the outcome of the surgery, as well as how consistent you are with performing your therapeutic tasks. The first stage begins almost immediately after surgery. In this stage, your shoulder may be temporarily immobilized; however, your doctor may have you begin to move your arm and shoulder as early as the first or second day. You will also need to ice your shoulder. Ice will help control swelling and provide temporary pain relief. Ice often throughout the day for about 20 minutes at a time. The first stage may last a week or longer, depending on the type of surgery. As your shoulder begins to heal, light massage may be necessary to help maximize the mobility of your shoulder joint and to reduce lingering swelling. You will also begin range of motion exercises. There are two kinds of range of motion exercises: passive and active. In passive range of motion, you lie still while a physical therapist moves your shoulder through its range of motion. In active range of motion, you move your shoulder by yourself. This stage can begin as soon as you are able and can last several weeks. 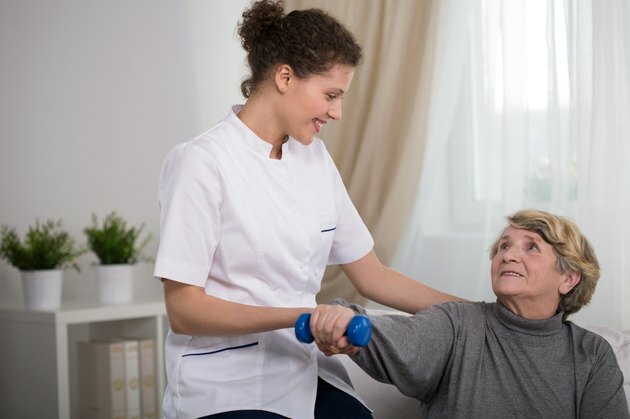 Once your shoulder has healed to the point where you can effectively complete a variety of active range of motion exercises, you can begin performing exercises to strengthen the muscles that support your shoulder joint. After surgery, the affected muscles may atrophy, or lose size and strength. To reverse this effect, a physical therapist will direct you through a series of exercises that are designed to rebuild muscle tissue that was lost or damaged during and after surgery. As your muscles strengthen, the exercises will become more advanced. This stage may last weeks to months following surgery. When you have regained normal strength and flexibility in your shoulder, you can return to normal activity. Even though you may be fully recovered from your injury and subsequent recovery, your physical therapist may still recommend that you continue to perform the flexibility exercises given to you in the second stage and the strengthening exercises from the third stage. This will help ensure that the muscles and ligaments that support your shoulder joint remain strong and flexible, reducing the chance of reinjuring your shoulder.